Since her writing career began in 2005, Nebula–nominated author Caroline M. Yoachim has written over a dozen short stories which have appeared in Lightspeed, Interzone, Daily Science Fiction, Shimmer, and Asimov’s, among many other top–notch markets. In 2006, Ms. Yoachim graduated from the Clarion West Writer’s Workshop, and in 2011, her novelette “Stone Wall Truth” was nominated for a Nebula. This issue of Apex Magazine includes Caroline M. Yoachim’s heartbreaking flash fiction story “Paperclips and Memories and Things That Won’t Be Missed.” In this interview, Ms. Yoachim discusses with us the challenges of character development, her approach to flash fiction composition, Habit RPG, and junkyard pixies! APEX MAGAZINE: This is a lovely tale, very finely wrought with an intense emotional kick woven into its core. What was the initial spark that made you sit down to write this story? CAROLINE M. YOACHIM: The initial spark for this story was a prompt and a deadline — I wrote it for a writing challenge I do every year called Weekend Warrior. The challenge is run through Codex, an online writing group I’m in, and participants write a flash fiction story every weekend for five straight weeks. Vylar Kaftan writes the prompts for the challenge, and the one that sparked this story was to chose any three words from a list of twenty and write a story that included those words. I selected ghost, peanut, and invoice, but the list of words also got me thinking about odd collections of things. I liked the idea of ghosts collecting little things from the world of the living. At the time I wrote the story, my youngest daughter was about 3 months old, so the other bit of inspiration for the story was her fondness for warm bath water and white noise. AM: Flash fiction can be a major challenge to write in a way that feels complete, but this story has a satisfying wholeness to it. How do you approach writing a piece of flash fiction versus other short fiction? What kinds of things do you take into consideration? CMY: This is a tricky question for me. I’ve written more flash than any other length of story, and most of what I do is intuitive rather than planned. When I’m writing flash fiction I spend a lot of time on the opening paragraph. Since flash is so short, those first few sentences are crucial in getting the reader grounded in the story. The first paragraph (often the first sentence) introduces the speculative element for the story, and also sets the tone. The beginning has to set up the reader’s expectations so that the ending will be satisfying — if I stick a humorous ending on a melancholy opening, the reader will feel cheated. Or if I introduce the speculative element too late, it feels like a twist or a cheat, instead of the premise for the story. AM: What was the easiest part of writing “Paperclips and Memories and Things That Won’t Be Missed”? What was the most challenging? Was there any part during the writing of this particular story where you surprised yourself? CMY: The easiest part was coming up with all the random little things ghosts might collect. The most challenging thing was figuring out how to include (1) the rules of how collecting worked and (2) all the necessary backstory for both Margie and the narrator. To get everything in, the story definitely jumps around a bit, and coming up with smooth transitions from one paragraph to the next was often tricky. The moment where I surprised myself was when I was writing the ending and realized that the baby could also collect things — which resulted in my favorite paragraph of the entire story. AM: On your website, you mention that you started writing speculative fiction in 2005, and in 2006 you attended the Clarion West Writer’s Workshop. What drew you to writing fiction and what was it in 2005 that sparked the determination to take your writing to the next level? I wrote three or four chapters of a truly terrible novel, realized I was in way over my head, and sought out a writing group. I heard about Clarion West shortly after joining the writing group, and the concept of spending six weeks surrounded by a bunch of other writers and focusing on nothing but writing sounded amazing (and it was!). AM: Do you have a set writing routine for yourself? Do you write every day, or in bursts? Work on multiple projects at a time, or focus on just one? Do you use any specific methods for keeping yourself on track on a given project? I used to write one story at a time and not start another until the first was either finished or trunked, but lately I’ve shifted to working on several projects at once. I’m not sure what prompted the change, or even whether it is a good thing. I used to force my way to the end of a story even if I felt like I was stuck — now if I get stuck I tend to jump to another project for a while and then come back. I recently found a great tool for staying on track with my projects: Habit RPG (habitrpg.com/). It transforms your to do list into a game, and as you get things done you are rewarded with gold and eggs that hatch into pets. AM: What is your editing philosophy? What works (and what doesn’t) for you when approaching an initial draft? CMY: My revisions process mostly consists of reading through a draft repeatedly, and fixing whatever things bother me the most on each pass. This is often incredibly inefficient, because even if I know that something about the middle of the story is broken, I will still do a full pass from the beginning all the way through to the end changing all kinds of little things as I go through. Part of the reason that I do it this way is that I have a terrible memory, and I worry that if I jump around fixing things out of order the story will crumble into a bunch of pieces that no longer fit together. AM: What is the best piece of advice you ever received about writing? What was the worst? CMY: The best piece of advice is one that I’ve heard from many sources: don’t self–reject. A story will never sell if you leave it sitting on your hard drive, so once it is “done” start sending it around. I can’t think of a worse bit of advice off the top of my head — if I get a piece of advice that doesn’t suit me, I tend not to remember it! AM: There always seems to be one element of writing that comes more naturally to any given author, be it world–building, or character development, or dialogue, or pacing, etc. Is there any element of writing that you find comes easily to you? Is there any element that you find particularly challenging? CMY: I’m not sure there’s any one element that always comes easily for me. I tend to start from a core idea (e.g., ghosts that collect or time that flows backwards or an enchanted carnival made entirely of sugar), and whatever elements tie in closest to the core idea of the story tend to come easiest for me. Character development nearly always gives me trouble, and I have a tendency to avoid dialog as much as possible because I have a hard time making it sound realistic. AM: You’re also a professional photographer. How did you become involved in photography, and what about that visual art form inspires you? Do you have a favorite picture? CMY: With two young kids, I haven’t had the time to keep up with photography and writing, so photography is more of a hobby than a profession for me these days. That said, I still love taking pictures, and I hope to get back to doing more photography eventually. I love the way photography can capture a moment in time. A picture can evoke emotion or trigger memories or inspire an idea (I sometimes use interesting photos as prompts for stories). But the thing that really made photography work for me was the transition to digital cameras. I love the freedom of being able to take hundreds of pictures and discarding all but the best three. It lets me, as a photographer, really experiment with the images in a way that I’d be reluctant to do if taking too many shots meant wasting film. I often wish that there was a writing equivalent of digital photography, where I could write a hundred stories and only submit the best few, but given how long it takes me to finish a story, I don’t think that would be a good strategy. AM: Being an author often goes hand in hand with being a voracious reader. What are you currently reading, fiction or non–fiction? Any recommendations? CMY: I’ve been reading a lot of YA and MG lately, to get into the right mindset for revising a middle grade novel I’m working on. I’m in the middle of reading Nalo Hopkinson’s Sister Mine at the moment — I picked it up because I saw it on the list of nominees for the Andre Norton Award this year. I’m not entirely sure I’d classify it as YA (although I can certainly see how it got there), but I’m enjoying the book. A couple other recent reads that come to mind are Rebecca Stead’s When You Reach Me and Ally Condie’s Matched. AM: What are you working on now, writing–wise (if you can say), and what can we look forward to seeing from you in the coming months? CMY: I’m currently working on revisions for a middle grade novel with the working title Junk Craft Magic. It tells the story of an eleven–year–old mixed–race girl who saves a bunch of junkyard pixies from a wall of hazardous waste. I’m also writing an assortment of short stories, including a couple of collaborations with Tina Connolly. AM: Thank you so much, Ms. Yoachim, for sharing “Paperclips and Memories and Things That Won’t Be Missed” with us here at Apex Magazine, and for giving us this behind–the–scenes glimpse of your writing! 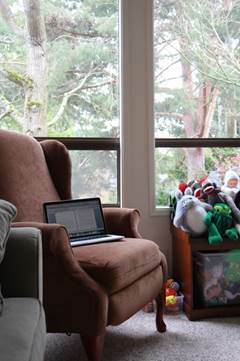 Maggie Slater writes in Portland, where she lives with her husband and two old, cranky cats. She has seen her work published in a variety of venues, such as The Storyteller Magazine, Fantastical Visions IV, and the anthology Dark Futures: Tales of Dystopian SF, from Dark Quest Books. She currently moonlights as an assistant editor for Apex Publications. For more information about her and her current writing projects, visit her blog at maggiedot.wordpress.com.